After eight years of helping Santa Barbara County safely dispose of more than 50,000 pounds of unwanted medicine and prescriptions through its Operation Medicine Cabinet program, the Sheriff’s Office is pleased to inform our community members of a new stewardship program that is making the disposal process more convenient and efficient than ever before. 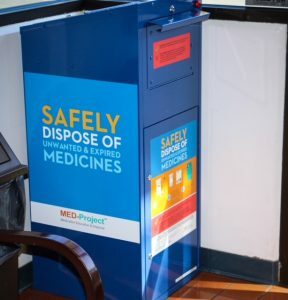 In March, Santa Barbara County MED-Project took over the medicine disposal program and has since installed kiosks at 18 locations throughout Santa Barbara County. In the near future, the kiosks will also be installed in 15 CVS store locations in Santa Barbara County. 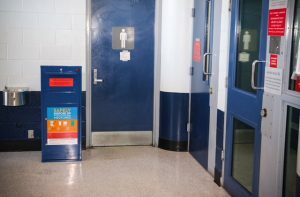 In accordance with Drug Enforcement Agency regulations for the program, the kiosks are located inside the facilities and are only accessible when the facility is open. The program is paid for by the pharmaceutical companies that sell product here in our county and the service is provided free of charge to community members. Disposal of medications in drop boxes assures medications are not misused by individuals who were not prescribed the medication. Collecting and destroying medication responsibly can also help reduce the number of opioid related tragedies. The program also ensures protection of the environment with the elimination of flushing unwanted medicines down the drain, or having them exposed to theft in the trash. In June of 2016, the Santa Barbara County Board of Supervisors passed the Santa Barbara County Safe Drug Disposal Ordinance. The ordinance requires any producer of prescription and over-the-counter drugs offered for sale in Santa Barbara County to participate in an approved drug stewardship program for collection and disposal of unwanted medicines. The ordinance is based on the concept of Extended Producer Responsibility Stewardship (EPRS) which makes the product manufacturers fiscally responsible for the full costs of their products including disposal. Santa Barbara County Environmental Health Services (EHS) oversees this program. Today, MED-Project has more than 300 kiosks in sites across Washington State and Northern California. The Sheriff’s Office wants to thank everyone who was a part of our successful Operation Medicine Cabinet program, which was started in 2010. While we are proud of the efforts that went into this important endeavor, we are pleased there is now an improved and more accessible medicine disposal program for our community members.